Our Memorial Show for our friend, the late Tom Buechner, has come down. It was a great success and we thank everyone who came out to see Tom’s work as well as the Tribute show of work by Tom’s paintings companions and students. We have been running a series of essays by those artists who participated in the tribute show and will continue to do for the next few weeks. 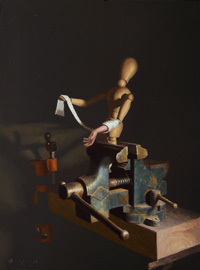 Today we feature the essay of painter Tom Gardner. In 1974, Tom was about to have his first one man show ever, at The Art Shop in Elmira, when I met him. He saw some paintings of mine stacked up next to the door, and against tables and benches and in the doorways. He couldn’t miss them. He had to step over them to get thru the place. He invited me to come to his house and paint with him on Saturdays, as I heard he might do if he knew you were a painter too. And he did! I still have the painting I did that Saturday. It was a most unfortunate effort, to say the least, and I held on to it to remind myself how much I had to learn. In those days Tom was still a captain of industry and somehow found the time to show me what to do. There was no studio, per se, in the house back then. We just rolled the living room rug up and painted, the two of us. Oh, there are so many things to remember, but let it suffice to say that Tom gave me the equivalent of a university education in art, with a minor in opera, fine coffee, and the finer points of living. He really did show me a world I never knew existed. It all brings to mind the words to the song “To Sir With Love“…and it would revolt him to no end to be the object of such a maudlin swill. The comparison would not set well—sentimental slop—but true, all the same. I did learn one good lesson over my years of association with Tom. That was to listen carefully anytime he talked about art or the craft of painting. There was always a gem hidden in there somewhere. Over the years I would hear him tell a student to do this or that, and once I said, “You never showed me that”. He said, “You wouldn’t have listened, Gardner, and besides, I had to try this stuff out on someone, and that was you—sort of a trial and error thing. Thanks for being my test dummy”. Well, I guess I’m still ramming my head against the creative wall, and when I do, Tom’s voice is always in my head with a good answer to the problem. It’s hard to discover your own voice as an artist when such a strong voice is guiding your hand at every turn, but Tom wouldn’t let me settle for less in myself. He demanded my very best at all times. 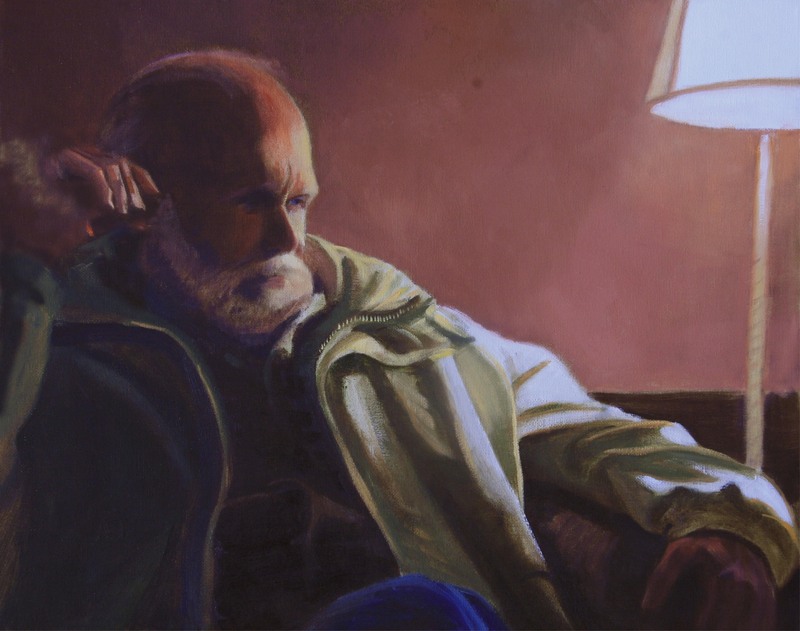 Yeah, there is some of Tom Buechner in every painting I do. Like it or not, he’s a part of my artistic DNA. The clouds were nonstop and rain and fog were unrelenting for two days……then I got up the morning we were to take a train to Denali, 120 miles north of us and on the way to board, there it was sitting on the horizon, like a ghost. The clouds had moved on and the sky was perfect, so perfect the engineer of the train stopped when we were still 65 miles away just to tell us how lucky we all were . Well, I located the side trip excursion guy and told him to get me on one of those planes that fly up to a glacier on the side of Mount McKinley (Denali), and he did ! He said as soon as we unload at the national park, a shuttle will pick me up at the hotel and take me straight to the airport. And sure enough, the pilot told us how perfect the day was and he hadn’t seen it like this all season. 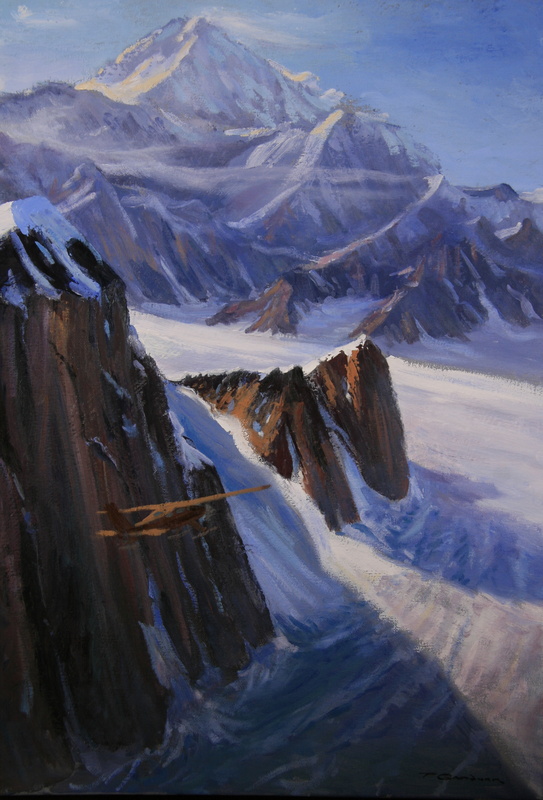 This painting is the final approach to our landing spot, Alice glacier, around the corner from this 6,000 ft cliff to our left. When we landed and steped out of the plane, onto the snow, there was a hush, noone could talk it was so magnificent. the mountain towered over us and yet it was still 15 mile farther up the glacier. this mountain is taller, by 2000 ft., than Mt Everest. Although it’s not the tallest point on earth by 9,000 ft. Everest starts out on a plateau that is already 11,000 ft tall. I’ve managed to paint 6 canvases so far, but there are plenty more to do. 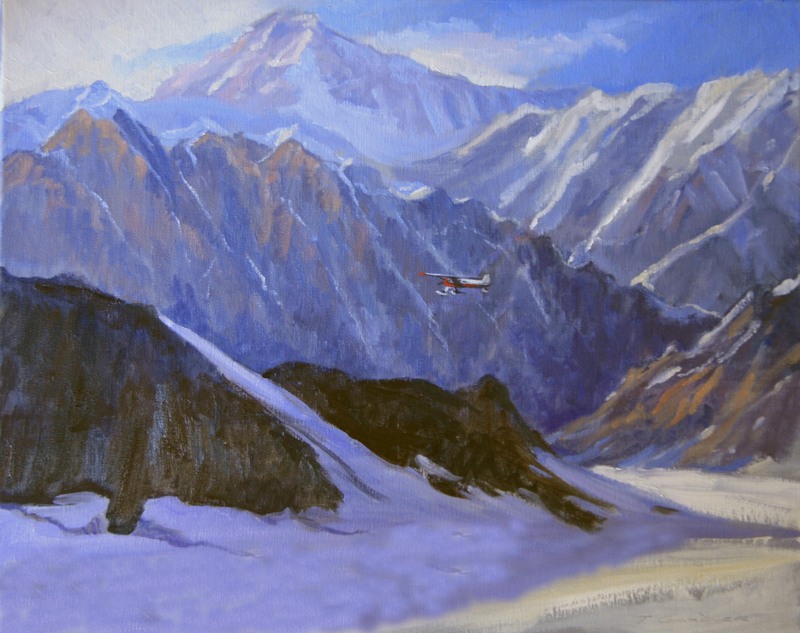 Sydney Laurence did a beautiful oil of Mt McKinley, that hangs on the second floor landing of the Rockwell Museum. It’s stuning, you should stop in and see it. Of course, down lower , at Glacier Bay, we saw a few griz along the shore munching on a beached whale, gettin fat, and playing in the water. This trip will keep me busy for quite a while. 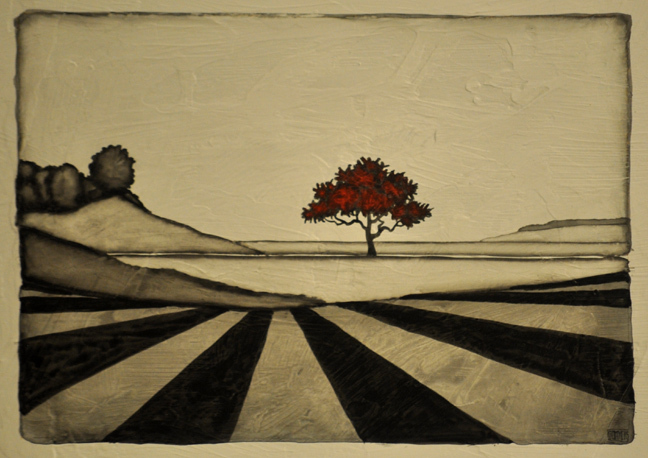 AND….. if you haven’t seen G.C.Myers show at Westend Gallery, by all means DO. He reminds me of what one of the dudes in ZZ TOP said , the last time I saw them,…”hey folks, after 30 years, we are the same three dudes, playing the same three chords…” Oh but what chords they are !!!! Well ,Gary dosen’t have to travel to Alaska, or Italy, or any other place …. except in his mind to paint the same tree and make such fantastic views over and over again. Always taking you somewhere new and worth visiting. I love the colors he is using and way he is handling the glazes. Damn Good Stuff. One of the Reference Photos for "Four Views"
Two new exhibits open tonight, July 22nd, at the West End Gallery. 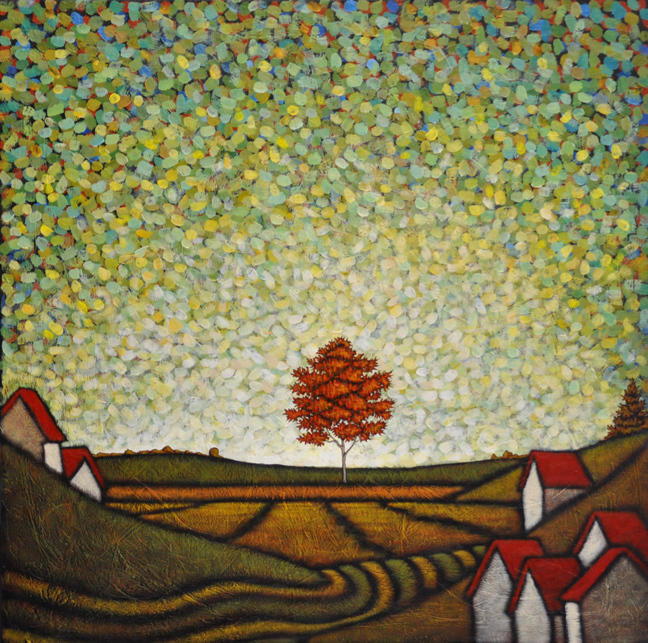 In the Main Gallery is New Days from GC Myers, a group of new work in his 10th annual show here. 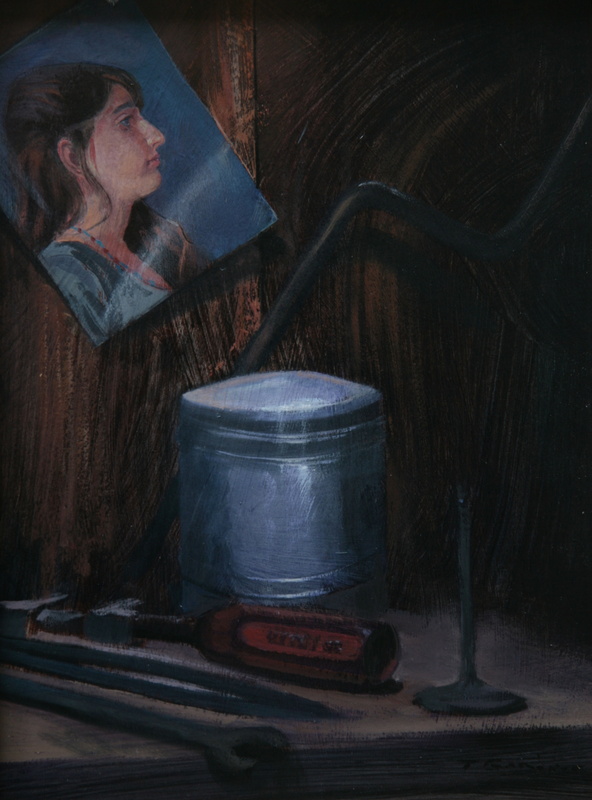 In the Upstairs Gallery, an exhibit also opens called Four Views which features four of the most popular gallery artists- Tom Gardner, Marty Poole, Dustin Boutwell and the late Tom Buechner– all working from the same reference photos. Each artist submitted two of their own photos with an additional two photos submitted by artist Wilson Ong who was not able to take part. The result is four differing views of the ten photos, all painted in the artists’ own distinct styles. 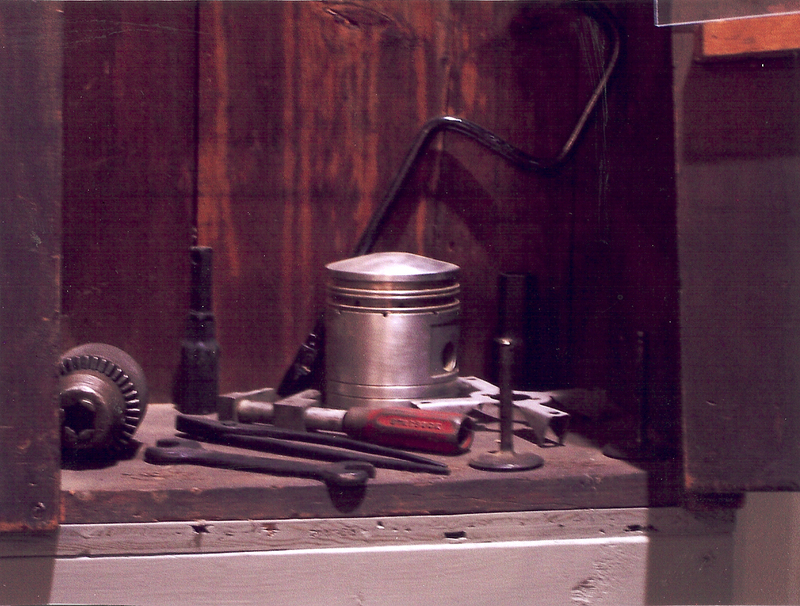 In one example, one of the photos (shown above), Parts, is a still life featuring auto parts on a bench. 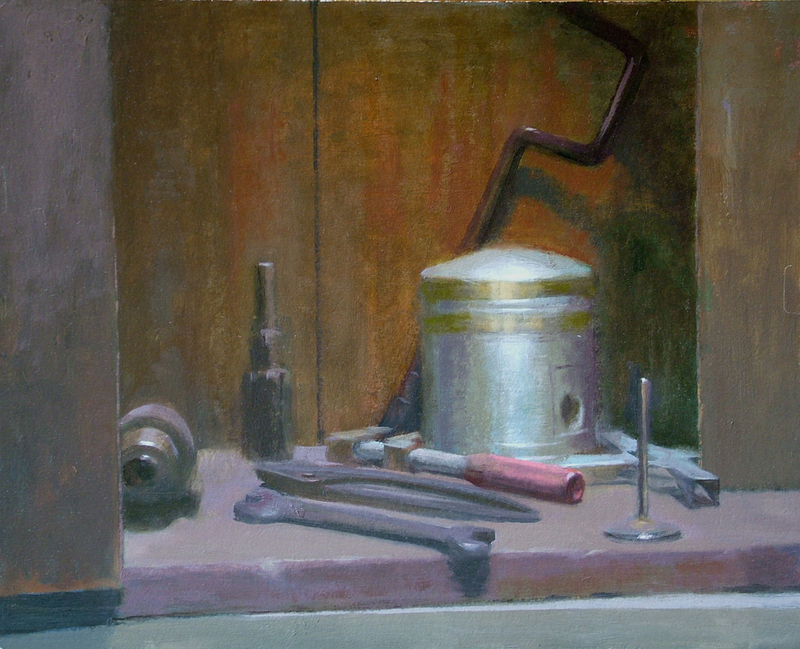 Each artist then worked on a still that remains faithful to the photo yet emphasizes their individual styles and techniques. Each version is similar yet very different. In the first example, Tom Buechner, working on his last group of work before his death this past June, chose to imbue the canvas with light, giving the parts a clarity of atmosphere. The composition is faithful to the reference photo but it takes on a feel that is all its own. Tom Gardner took the photo and added an element, a photo that is actually another of the reference photos. This addition, along with the compression of the space in his version and a slightly darker tone, changes the whole feel of the scene, adding a sense of it being a personal space. The bench scene becomes an extension of Gardner’s personality. 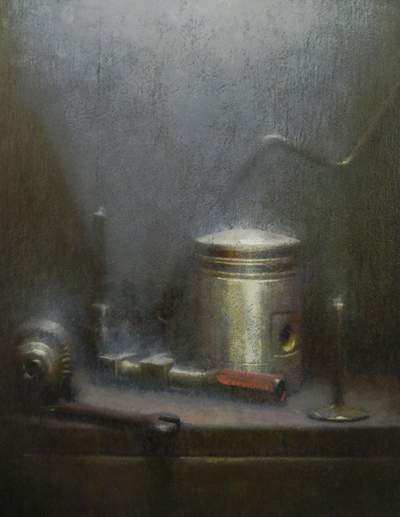 In Marty Poole’s version, the artist adds an ethereal light from above that gives the parts an otherworldly glow. He masterfully adds, with his handling of paint and light, a real sense of mystery to what might be considered the mundane. In his version of this photo, Dustin Boutwell turns to a hyper-realistic view. 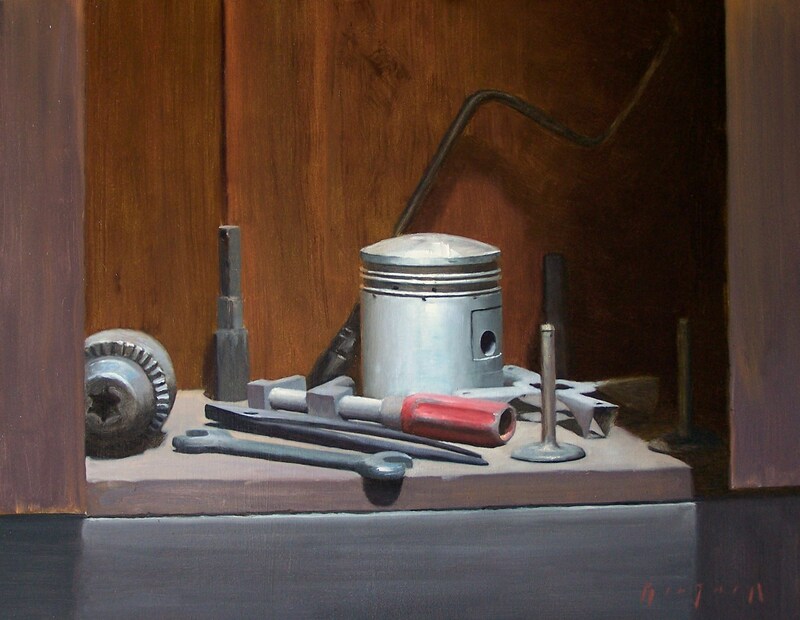 It is sharp and clean and a real tour-de-force in his handling of the paint and the subject, giving it the feel of the grand still lifes of the 1800’s. As you can see, each artist adds something of their own to their own views of the subject, making this a great exploration of how artists translate their influences. It is not a show to miss. Stop in and spend some time with these four masters of paint. This Thursday, July 22, marks the opening of New Days, my annual solo exhibition of new work at the West End Gallery in Corning. I have shown my work at the gallery for over 15 years and this is my tenth solo effort there. Feeling that the tenth show is sort of a milestone, I wanted to present the gallery with a show that really represented the full scope of my work over that timespan. I wanted to have much of the imagery that I’ve featured over the years– the Red Tree, the Red Chair and the Red Roofs, for instance– plus a few new twists. Probably the most evident new twist is a small group of pieces that feature works on paper done in monochromatic shades of black, white and gray. I basically wanted to take color out of the equation and focus on the design aspect of the work, letting other elements in the work carry the weight of the expression. Elements like line and shading take the place of the deep colors that have been part of my work for some time, giving the work a different feel even though the imagery is very much mine. The best aanalogy I can give for this work is that it’s like a song that you know so well, played by one artist in one way. Then one day, you hear a version of that song played in a very different manner and the song becomes something different. Something new. Same song. Same tune. Same lyrics. Just played in a different way. That’s how I see this group of work. The absence of color, for the most part, gives the pieces a feeling of spareness. As though all emotions aside from that of the main gist of the piece have been pared away, bringing the main emotional point of the painting into sharp focus. The bits of color that are used seem to pop on the surface with more force, no longer having to outshine other colors on the surface. The contrast pushes their prominence even further out in front, giving no doubt where the focus in each piece lays. Thematically, I wanted this show to be an optimistic one. I think for the most part, the feel from the pieces is forward looking. There is a feeling in many of them of having persevered and beginning to look ahead to the new day, which always holds the potential and promise of better things to come. Overall, I think this is a very diverse show for me with many contrasts and in color and textures. It says what I hoped it would and I think it holds together well on the gallery walls. Many thanks go out to Linda, Hedy and Bridget for their always kind encouragement. If you get the chance, please stop out at the opening this Thursday which runs from 5-7:30 PM at the West End Gallery on Market Street in Corning. 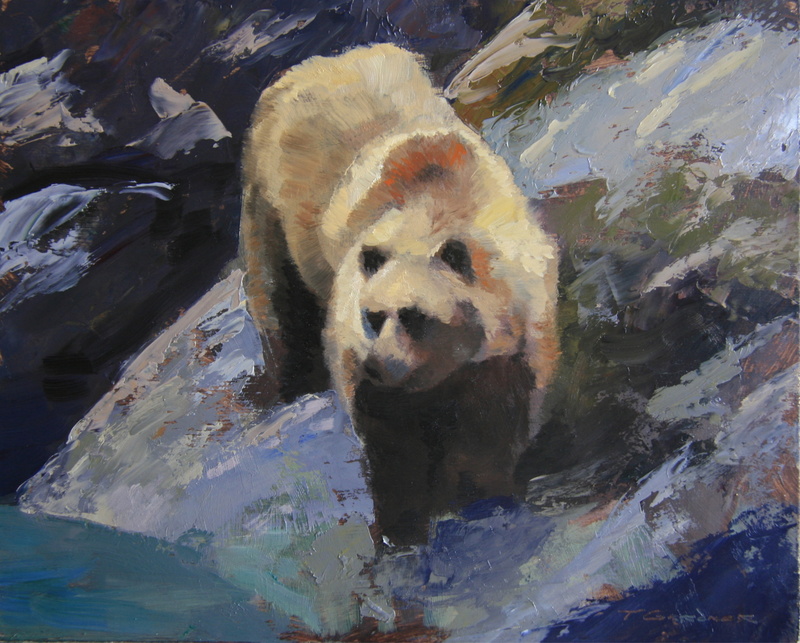 You don’t want to miss the exhibit in the Upstairs Gallery featuring painters Tom Buechner, Tom Gardner, Marty Poole and Dustin Boutwell all presenting works based on the same reference photos. Really, really interesting work and a chance to see some of the late Tom Buechner’s last work. 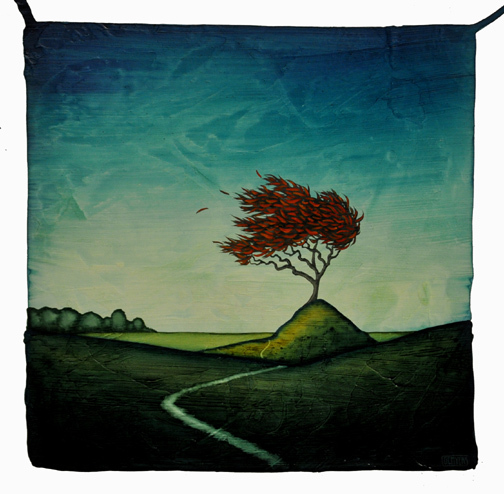 Look for West End Gallery artist Dustin Boutwell in this month’s issue of the online magazine, POETSandARTISTS. There is a wonderful spread featuring a question and answer session with Dustin as well as some inside info on some of his unique signature pieces. It starts on page 64 which you can scroll to on the bottom of the page. It’s a great look at the work of one of the most talented painters to emerge from this area. Don’t miss it! 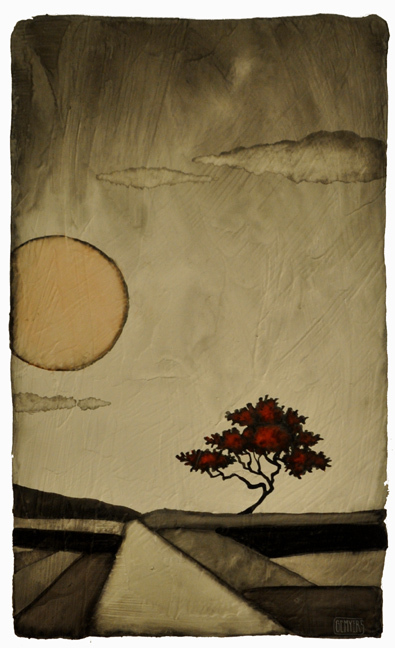 And to see more of Dustin’s new work, stop in starting July 22 at the West End Gallery. Dustin is one of the four artists in the Upstairs Showcase, Four Views. In this exhibit four of the gallery’s top artists- Dustin Boutwell, the late Tom Buechner, fresh off his recent solo show Marty Poole and Tom Gardner– each do their own interpretation of 2 photos submitted by each artist plus two from another artist not participating in the exhibit. So, there are ten photos with four differing versions of each. It should be a most interesting show! Must see! Congratulations, Dustin, on the great article and on the great work! If you haven’t made it in to the West End lately, stop in and see the new show, Lake Effect, from local painting (and sculpting!) 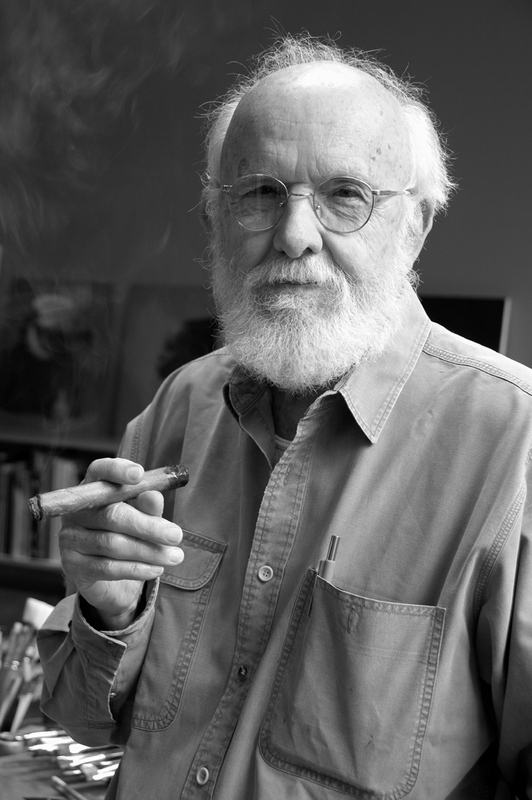 icon, Tom Gardner. It’s perhaps the best group of work he’s put together for a show. Every piece is strong and has wonderful surfaces and deep colors. When you stand back and take in the group as a whole, there isa feeling of unity and continuity that runs through each piece. Nothing feels out of place, even a piece like the one shown here. This is a favorite of mine, Amish DriveBy. It’s a pretty large painting, somewhere in the 48″ by 48″ range I think, and is, at first blush, a completely different animal in Gardner’s painting menagerie. But for those of us who have followed Tom’s work for years, it has his fingerprints all over it. He loves to work with juxtapositions of contrasting sensibilities, the quiet set against the loud, and this is a great example. 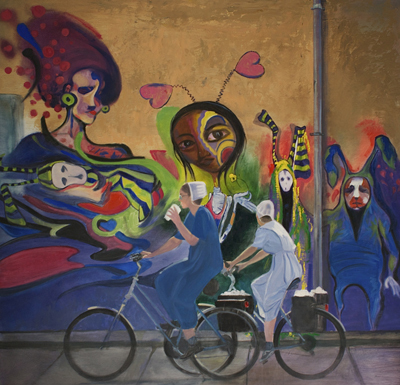 The Amish girls on their bicycles seem to be out of place alongside the bold, exaggerated figures on the wall but there is a certain harmony there in the two existing side-by-side. It feels odd but normal at the same time. I love the paint handling Tom has employed in painting the wall and the figures. The texture and color is wonderful, a real pleasure for the eye to take in. There’s a richness in it, as I told Tom at the opening this past Friday,that makes me want to rub my hands all over it. His ability to harmonize the rich primary colors into the scene makes the painting sing. 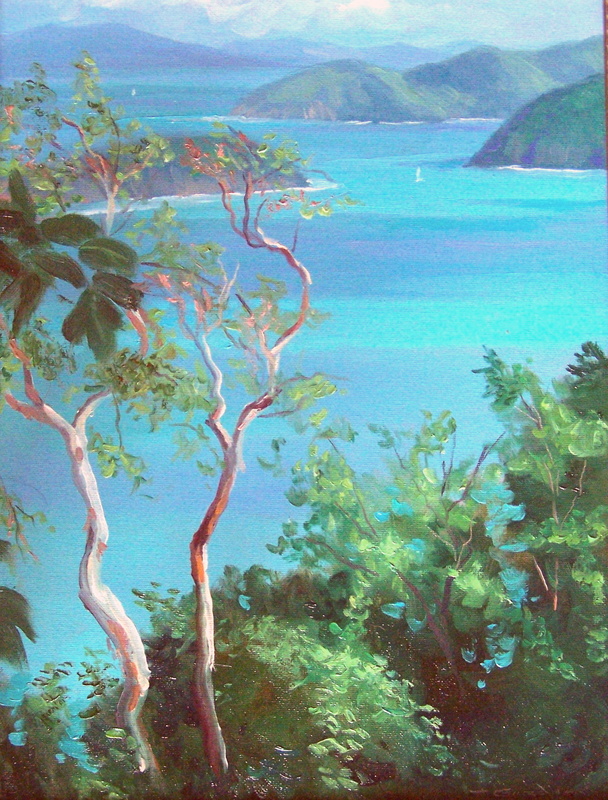 On the island of St. John, in the American Virgin Islands, on the north shore is a place called Peter Bay. It’s a gated community with fabulous houses over looking the bay. This is Lower Peter Bay,where Kenny Chesney has a beautiful house, tucked high over the turquoise waters. Across the road and up the hill is the new Upper Peter Bay development. And when I say upper, I mean put on your oxygen masks, cuz the drive is a series of switchbacks that wind you slowly up into nose bleed altitudes. This is where I saw and painted this piece . I sat on the deck where the wedding reception was held when Chesney and Rene Zellweger got married. This is just a small part of the view to be had up here. The full view looks from St Thomas, on the right to 180 degrees to your left to Tortolla. The island in the distance is Yost Van Dyke and the closer islands are a part of St John. If you stepped off the edge of the deck, you’d plunge down the hill and you wouldn’t stop (unless a tree stopped you first) until you’re on the beach. 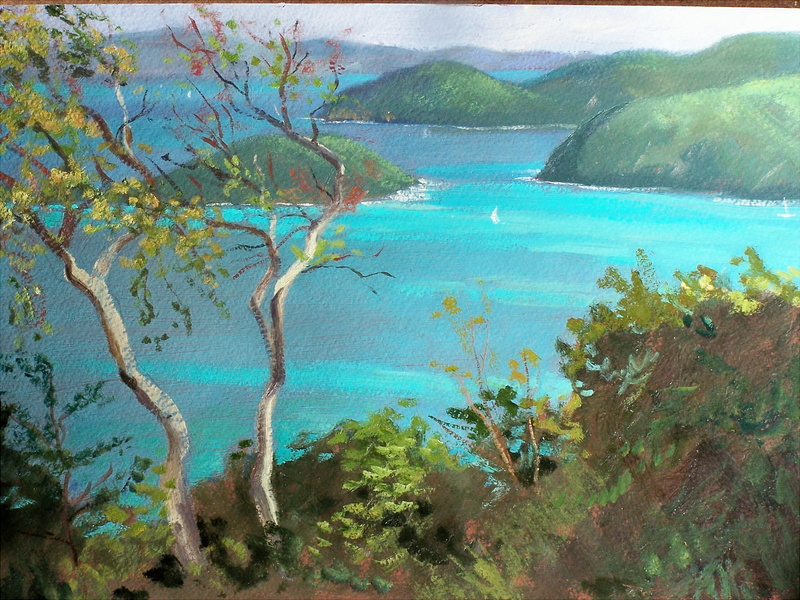 I met Kenny one morning while I was down on the Trunk Bay Overlook where I was celebrating the finish of a small sketch. The light really threw me for a loop and I was having a hell of a time getting it right. Well, finally, at 10 am, I got it, and decided to open a bottle of wine , turn up the radio and dance a little. Well, sure as heck, a Jeep pulls up with four dudes in it, with baseball hats on, smiling and lookin’ at me. I told them it’s a hell of a job, painting, but someone has to do it. They took a photograph of me and took off. I found out later that it was Chesney and his bunch. When I got back to the studio, I decided to lay the scene out a little differently and try it bigger: thats when this view was born. On a makeshift counter, made of a huge squared off log at the end of the deck is carved ” moments turn to minutes, minutes turn to days, days turn into memories” . Well, these moments turned into this memory of a fantastic time in St John, a view that very few people have ever seen in St John. You are currently browsing the archives for the Tom Gardner category. An exhibit of new paintings from Bridget Bossart van Otterloo and Brian Keeler. Bridget Bossart van Otterloo/ Brian Keeler Show Opens Friday!